Not to add more fuel to the fire but there's quite the stir today over at the rumour mill involving one-time blog darlings Clap Your Hands Say Yeah. Word is that the Brooklyn outfit are taking a break, with the band effectively pushing back all recording plans and clearing their calendars of any future live dates. However, according to CYHSY's manager Nick Stern, the band aren't necessarily breaking up, just unlikely play to together anytime soon. 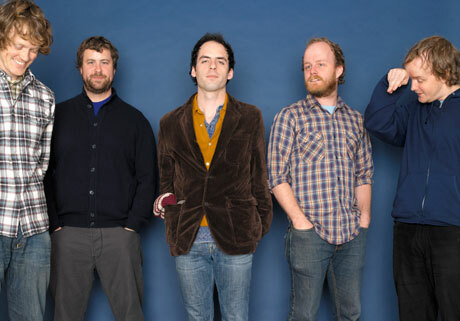 "It's true that Clap Your Hands Say Yeah have decided not to go back into the studio at this time while the guys work on other projects," Stern told NME. He was quick to add, though, that the online break-up rumours were the simply the result of people "probably reading a bit too much into things." Whatever the group's real future may be, the band members have lined up quite a few side-projects. Bassist Tyler Sargent and guitarist/keyboardist Robbie Guertin recently formed a multimedia project with Au Revoir Simone's Annie Heart called Uninhabitable Mansions. Front-man Alec Ounsworth is apparently working on some solo work. And drummer Sean Greenhalgh is in a, um, Guns N' Roses tribute band, Mr. Brownstone. The last CYHSY show for the foreseeable future is on February 13 at the Brooklyn Academy of Music. Clap Your Hands Say Yeah "Is This Love?"